The Mısır building is located in the central Beyoglu district of Istanbul and was comissioned by the Egyptian Abbas Halim Pasha, to the prominent armenian architect of the times, Hovsep Aznavour in 1910. Hence the name of the building, Mısır apt. (Egyptian apt.) 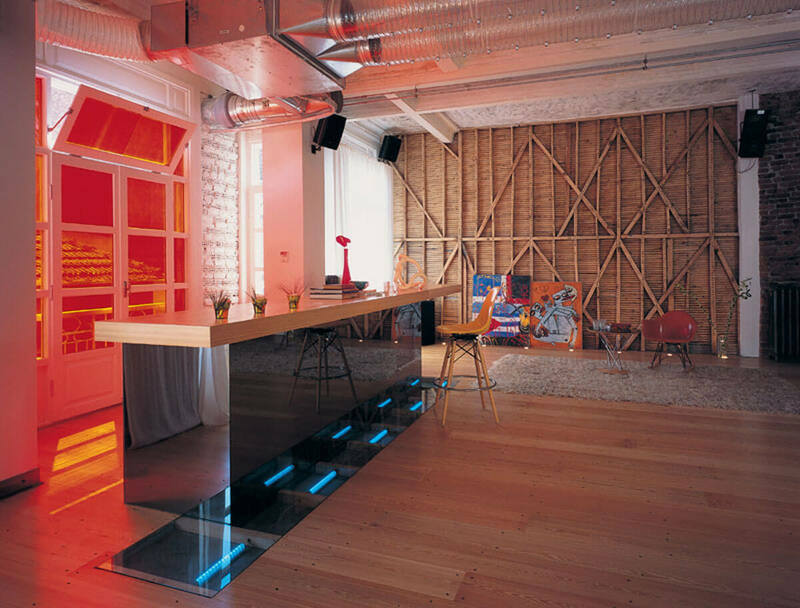 We were given a brief to create a 280m2 loft on the second floor of this building to serve as a second city home for a couple who like entertaining and like to stay in alternative homes during the week. At the entrance we lifted the floor to become a counter which is used for dining and working. 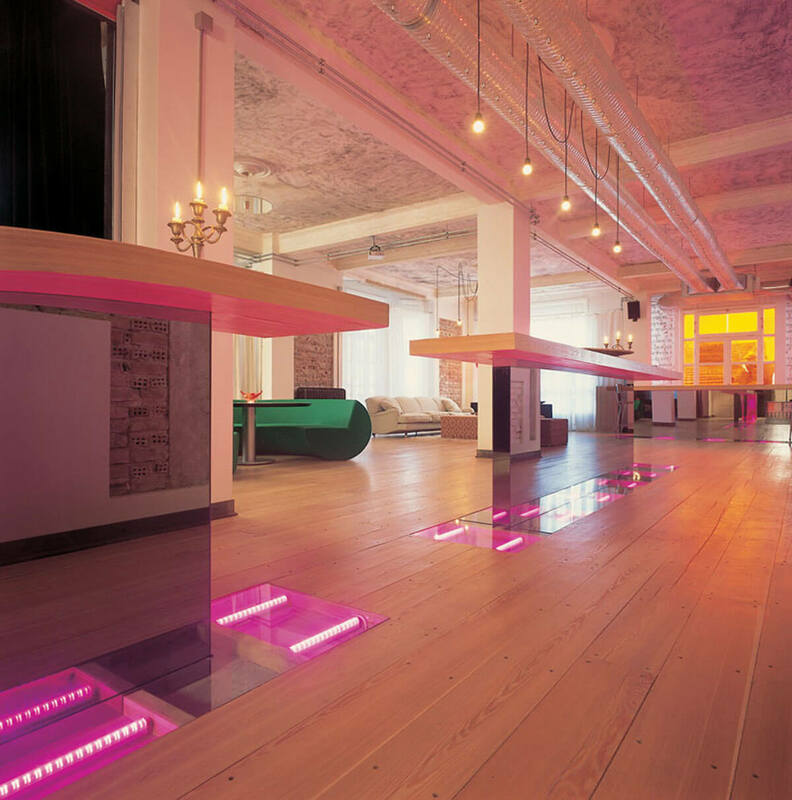 We placed colour changing light strips into the tear in the floor which are controlled by a computer to create different moods. We designed a bedroom where one wall is glass the other a remote controlled, red pvc garage door. The black lacquered bed is placed in the middle of the room with a black velvet curtain that can close off the entire space 360 degrees to enclose you. There is no other furniture in the bedroom. Clothes are either hung behind the curtains or placed folded in the draws surrounding the bed. We exposed the original brick and structural timber in places to keep the original flavour of the building and burnt the plastered ceilings with a torch to create an organic texture. We placed two transparent flexible pvc pipes running parallel and inserted specially laithedaluminium nozzles to create an air conditioning unit where bone blows and the other draws. The lighting system is made of simple black electrical wire and hanging light bulbs. In the living area we designed a homemade chandelier using these materials. In the bathrooms we cut oval marble and steel pieces and placed them into the screed to create a terazzo like textured floor. The cabinets were custom made with bamboo veneer. The kitchen was created to be open and transparent. We used glass doors on equipment to display cooking ingredients as part of the space. The dj counter also appears as if its cut out from the floor and lifted. 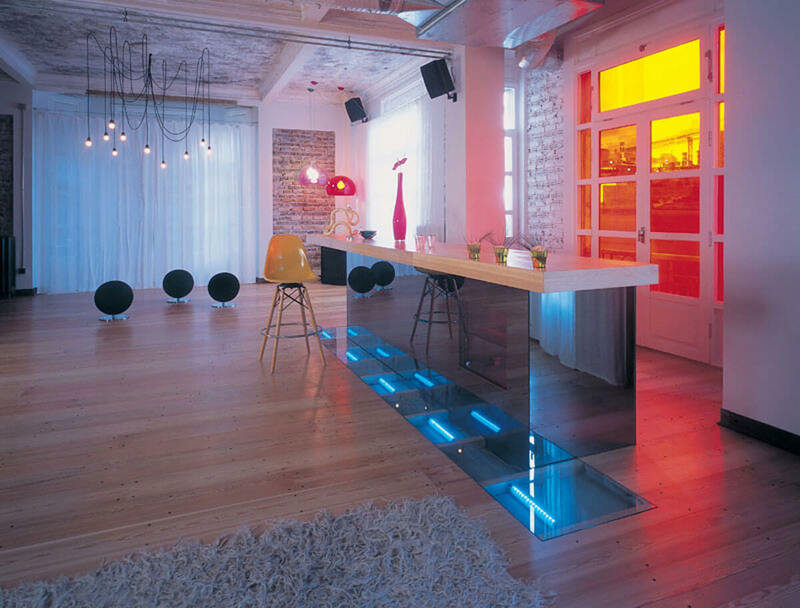 The coloured lights and its mirrored base make it appear as if the pine counter is floating in space. The green circular dining booth was designed by Atelier Derin to serve more formal dinners in the space. 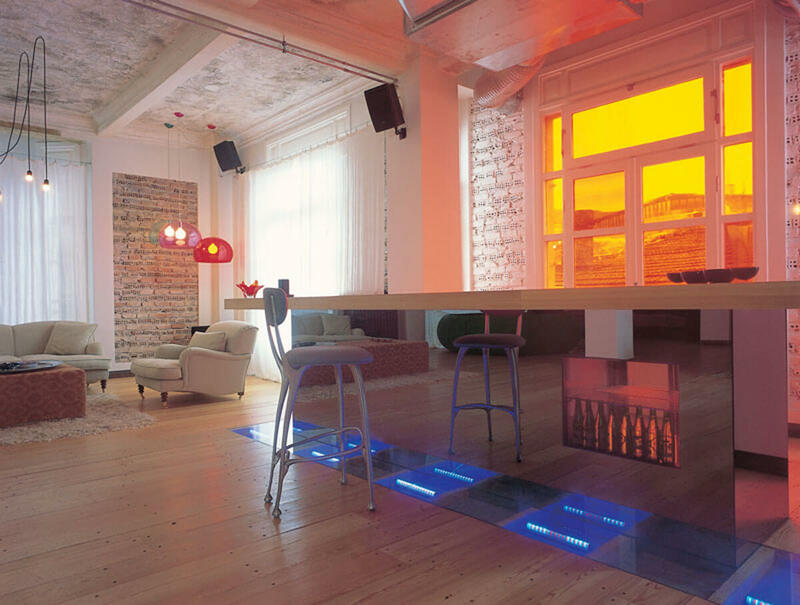 The projector light placed in the middle of the taple is reflected back onto the table by the mirror disc hanging above it from the ceiling. A screen slides down over the glass wall separating the bedroom and the dining area for projection of films. 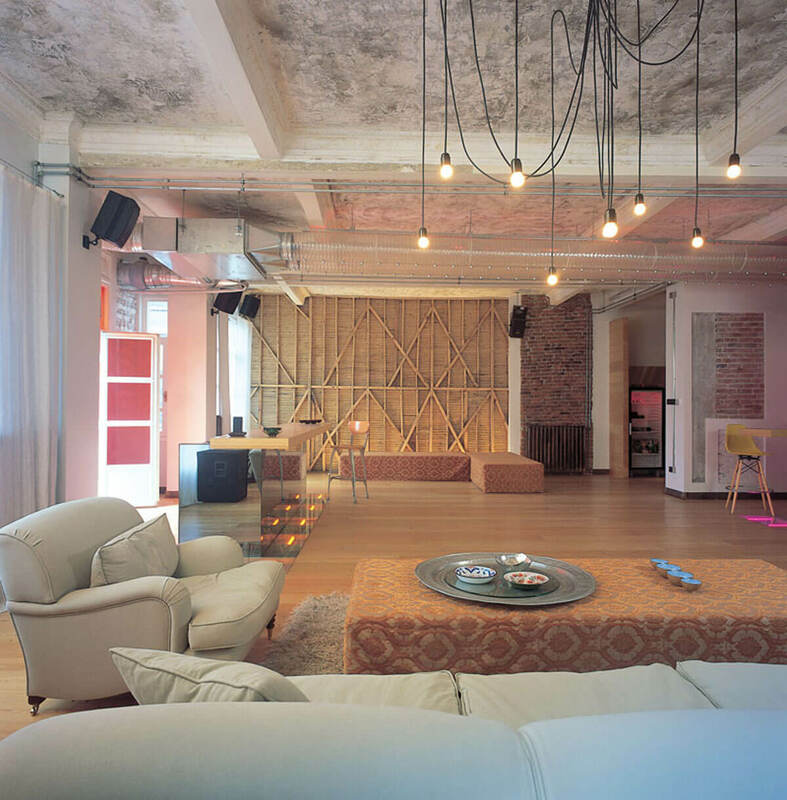 This loft is one of its first kind in İstanbul.